Casa de praia em excelente localização na bela praia de areia em Del Mar a uma curta distância de muitos restaurantes, lojas e da aldeia. Esta localização é à direita na areia. pores do sol requintados, golfinho / observação de baleias, surf, natação ou apenas relaxar na praia. 3 quartos, 2. 25 banho (chuveiro fora da praia) com deck ao ar livre, os lotes de estacionamento (garagem para 2 carros e 2 lugares de estacionamento fora), completamente mobilados e equipados com utensílios de cozinha, roupa de cama, máquina de lavar / secar roupa, etc. Pronto para as suas férias fantásticas na sua chegada. We're pleased with our stay at this beach house right on the beach. The location can't be beat. It's close to the lifeguard HQ, the lifeguard 17th street tower, and close to Poseidon and Jake's restaurants, the park (for meeting up with surf instructors), and the semiprivate walkway entry to the beach is great. The home is stocked with kitchen equipment, a huge supply of beach towels, and a convenient washer/dryer. Everything was clean and ready for us. Also convenient was being right at 18th Street and walking around the neighborhood when not on the beach. Bottom line: we would stay here again. Del Mar is always one of our destinations due its dog-welcome policies, and we're pleased to see the city council has increased the dog friendliness to tourists with dogs. People on the beach are very friendly to dogs. The property was located right on the beach and was the perfect family home for our Thanksgiving holiday. Nothing more fantastic than a lovely sunset experience at this beautiful location. 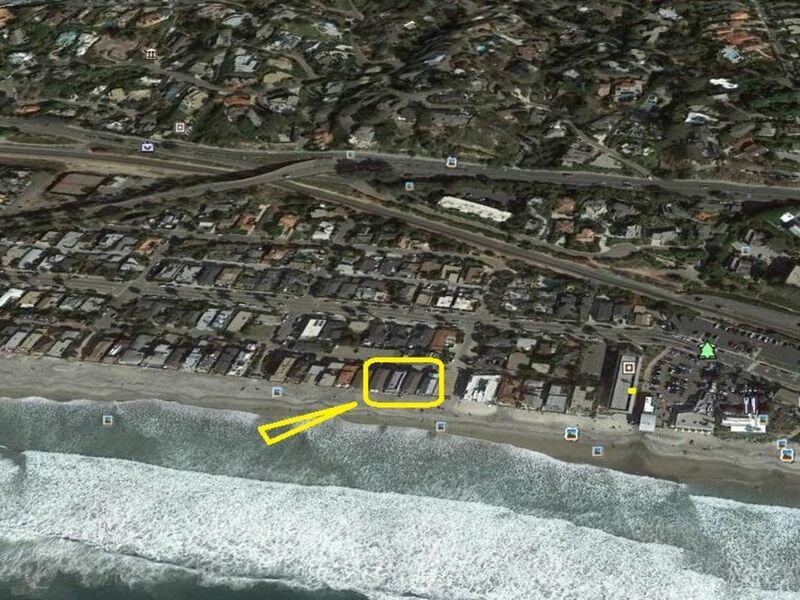 The house is in the perfect location on Del Mar Beach. The views and beach access can’t be beat! We had everything we needed and we look forward to returning soon. Our family stayed here and we absolutely loved it. The home is well stocked with everything you need. Clean and very well maintained. I loved the kitchen because of the expansive view of the beach and ocean while I cooked. And when we ate our meals the dining room table sits in front of an expansive picture window with a wonderful view of the majestic sunsets. The master bedroom bed was the best. Many good night sleeps on a A+ mattress listening to the surf crash onto the sand. One afternoon we must have seen about 100 dolphins splashing and swimming in the ocean. It was awesome. I would highly recommend this beach house for any family that wants to stay at a fun location on the sand. Great location on the sandy beach. We come to Del Mar to escape the Arizona heat every summer and have rented other homes. This place is the best. First, the location is excellent. I walked to Starbucks in the heart of the village most mornings. At night we would walk a block to Jake's and Poseiden restaurants. This area of the beach is the most sandy and the most desirable for beach activities unlike the more northerly section of the beach that is rocky and less sandy.The home is very well maintained and well stocked. Clean. Plenty of parking. Everything you want in an on the sand Del Mar experience.